...but I wasn’t on an island when I wrote the first draft. This spring I visited Innishbofin, an Irish island. Supposedly the pirate queen, Gráinne O'Malley, and the Spanish pirate, Don Bosco, had fortresses there in the 1500s, trapping unsuspecting ships in the harbor. For years Innishbofin was home to a thriving fishing community but famine, war and emigration decimated its population and now only a hundred and fifty people live there. It’s a quiet place with boats anchored in the protected harbor. Sheep dot the rocky hillsides and trails lead by peat bogs and ponds. When the fog comes it’s easy to imagine why pirates chose it as a hiding place. A perfect landing place for a pirate ship. 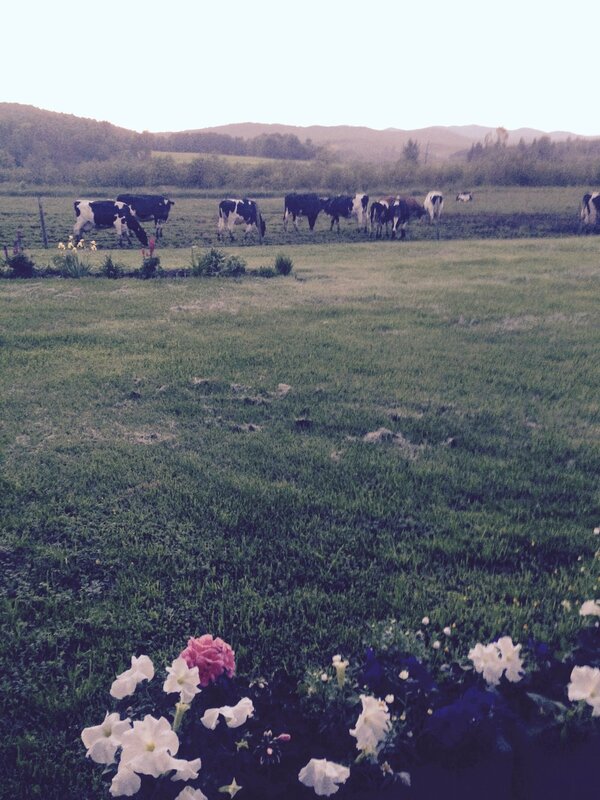 Inspiration cows on my Vermont farm. My new picture book is set on an island but I wasn’t on an island when I wrote the first draft. I was looking out at cows lazing in the pasture behind my house. In the distance the Lowell Mountains were hazy blue. A whirring hummingbird paused by the flowers outside my window. It was a summer afternoon in the Northeast Kingdom of Vermont, miles and miles from the ocean, with no island in sight. Here’s the idea that came to my mind: four babies appear mysteriously on an island. One is discovered in the mail bag, two are left on the ferry and one is found sleeping on the fish pier on a pile of nets. The babies are discovered by the ferryman, the harbor master and the fisherman and not one of them knows what to do. The librarian takes charge! Why an island? Why four babies? That’s the mystery of the imagination. It doesn’t surprise me that the librarian is the hero, the smartest one around. Of course she is! I love librarians. I was a librarian myself, working at the New York Public Library at the start of my career and ending my library career in a large school library. This is the first time a librarian has appeared in one of my books. I’m delighted that she’s the star.